I founded Devon and Cornwall Wild Swimming in 2010 with the aim of setting up a network of swimmers in the two counties promoting open water swimming in all its different genres.The groups began with just 5 members and now there are over 7000. My passions have evolved into Ice Swimming, sea swimming and endurance swimming. 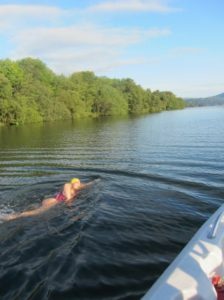 In 2014 I swam a ( 21 mile ) 2 way swim of Lake Windermere overnight which took me 16 and a half hours. 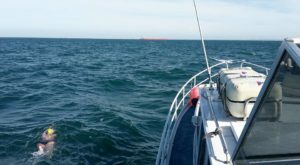 I have also swum a 4 person relay along the length of Loch Ness setting the UK record.ns ( Force 5 winds ) the swim was aborted after 13 and a half hours as I had been swept too far North to successfully land in France. ( At one point I was level with Belgium ! ). I swim without a wetsuit all year round and have taken part in the UK Cold Water Swimming Championships held at Tooting Bec Lido as well as PHISH ( Parliament Hill Ice Swimmers Hootenay) and the ChillSwim at Windermere as well as many international events. I completed my first Ice Mile in January 2014 and in 2018 become the first woman in the world and one of only 3 people to have completed 10 Ice Miles. ( an Ice Mile is a swim of 1 mile in water temperature below 5 degrees wearing just a normal swimming costume, goggles and hat - no wetsuit). One of my Ice Miles was swum entirely in butterfly and am the only person in the World to have completed an Ice Mile in fly. I am an ambassador for the International Ice Swimming Association and have competed in overseas Ice swimming events around the world. In 2015 I won the marathon Ice Swimming event in The Baltic Sea in Estonia by swimming 1200 metres in 1.7 degree water ( 28 minutes ) and in 2016 won the Polish Ice Swimming 1000 metres in a pool cut from the ice. In 2017 I founded The Polar Bear Challenge to encourage swimmers to swim throughout the winter and this now has 500 people taking up the Challenge. I organise several open water swim sessions in and around Plymouth where I live and I try to provide opportunities for those new to the sport to jump in and give it a go as well as encouraging more established swimmers to extend their swimming boundaries – safely of course!